An Inkling jumping into water in a pre-release version of Camp Triggerfish. 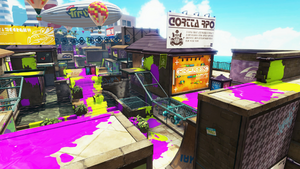 Water is a terrain feature in Splatoon. Water is a liquid found in many stages and Octo Valley missions that causes Inklings to dissolve when touched, forcing them to respawn. 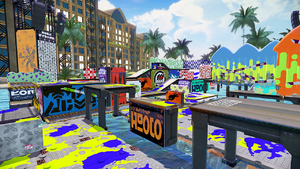 In a few multiplayer stages, such as Arowana Mall, water is used as a hazard to splat players who fall in. 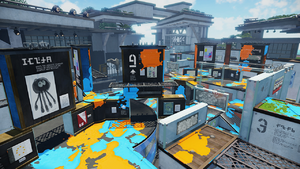 It is often placed strategically under grated walkways and platforms, so that players who become squids while on said platforms are forced to respawn. Water also surrounds Saltspray Rig, Bluefin Depot, and Camp Triggerfish. Arowana Mall is built next to a beach and includes several water features. 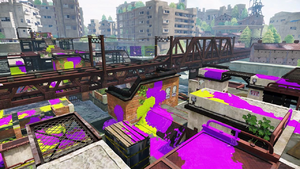 For instance, the central platform is surrounded by water, and falling through a grated walkway into this area will cause Inklings to respawn. Bluefin Depot is surrounded entirely by water. When leaving a team's base, the grated walkways to the left and front are located directly over water. 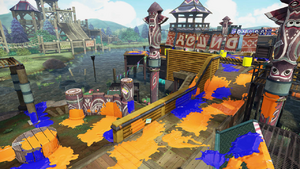 The two central areas are also encircled by water, meaning that missed jumps and poorly-timed Inkzooka blasts can force Inklings to respawn. Camp Triggerfish is built on top of a lake, meaning that a misstep can force Inklings to respawn. 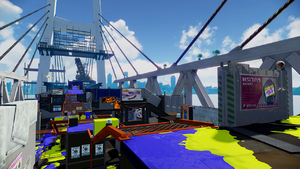 This stage also includes a multitude of walkways and platforms built out of net, and using squid form while on most of these platforms will plunge Inklings directly into water. Saltspray Rig is an oil rig off the shore of Inkopolis, surrounded by water. 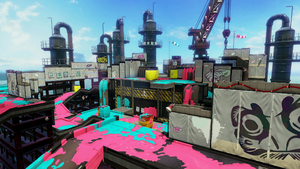 However, because of Saltspray Rig's height, Inklings who fall off the edges of this stage will likely be splatted by out-of-bounds limitations rather than the water itself. Hammerhead Bridge is surrounded by water, though it largely exists as part of the background and rarely causes splatting as opposed to out-of-bounds limitations. Piranha pit is surrounded by water. If the player accidentally falls off the island, they will be splatted. There is a fountain in Museum d'Alfonsino. Players who don't watch their step can fall in. This is most often when the tower is moving over it in Tower Control. 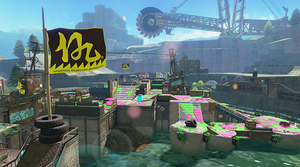 Water can be found on some levels of Octo Valley, such as Propeller-Lift Playground, as a hazard to Agent 3. An Inkling drowning in water. An Inkling after having dissolved in water. If the player gets splatted by water, the time it takes for them to respawn will be shorter than if they got splatted. This can be useful if a player is about to get splatted by an opponent. Jellyfish don't appear to have the same problems Inklings have with water, as they can be seen on boats, swimming in the water at Mahi-Mahi Resort and fishing with their long tentacles. The fact that Inklings dissolve in water is when in the end of the animation, the clothing and weapon of the Inklings is now shown sinking in the water.